The winner of the 2017 Gabrielle Roy Prize (English section), which each year honours the best work of Canadian literary criticism written in English, is Violence Against Indigenous Women: Literature, Activism, Resistance by Allison Hargreaves (Wilfrid Laurier University Press). resistance, Hargreaves demonstrates that literature and storytelling play essential roles in transmitting knowledge and anti-violence critique while working to effect social change. Violence Against Indigenous Women is carefully researched, sensitively argued, memorable, and deeply insightful. The winner was chosen by a jury composed of Aritha van Herk (University of Calgary), Robert Lecker (McGill University), and Andrea Cabajsky (Université de Moncton). The prize was awarded at a reception held by the Association of Canadian and Quebec literatures on the evening of May 26th in Regina. 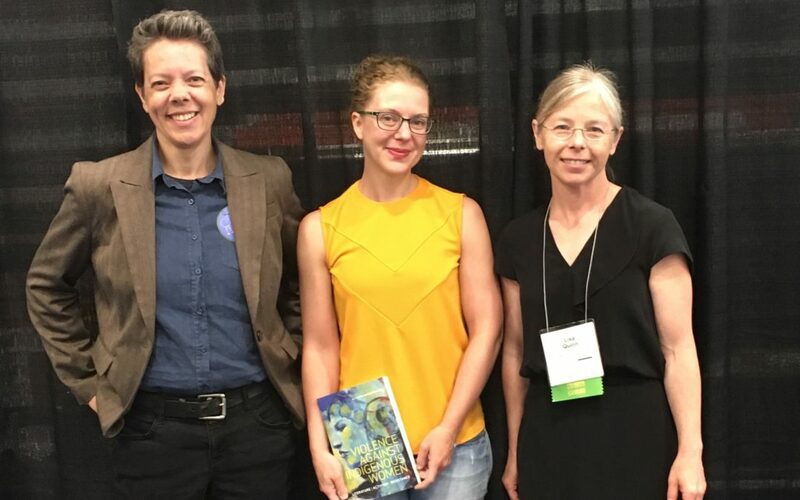 [The picture features Allison Hargreaves (centre), with Siobhan McMenemy (left) and Lisa Quinn (rigth) from Wilfrid Laurier University Press].